Merzouga is a village in the Sahara Desert in Morocco, on the edge of Erg Chebbi, a 50km long and 5km wide set of sand dunes that reach up to 350m. Most people are here to take a camel safari into the dunes, and to get a taste of remote (tourism-influenced) Berber life. The local population is mix of Arabs and Berber, and generally welcoming and friendly. From Marrakech, drive East to Erfoud (2 days drive, stop for the night in or near Ouarzazate). From Fez, drive South to Erfoud (1 day). From Erfoud, continue South 14 km (11 miles) to Rissani, carry on through the village and follow the road Southeast for 40 km (24 miles) to Merzouga. In recent years, the road to Merzouga has been asphalted and also to Taouz, a southern military border town (foreigners cannot cross here). The short access roads (1 or 2 km long) from the main road to the hotels alongside the sand dunes are normally not asphalted, but well maintained. There is now an asphalt road to Hassi Lybed, a smaller village about 4 km before Merzouga. From Rissani to Merzouga, a grand taxi or van is 10/12dh. If you don't want to wait for other people to fill your grand taxi, pay 60dh. If you arrive before sunrise (if you come in the 6=7am bus from Fez) you can pay up to 100dh for a grand taxi. Beware of guides in Rissani or Erfoud who offer to take you to Merzouga for 5 dihram each, but instead strand you at their auberge 20 km north of the village. If you decline their offers of camel rides and lodging, it is often quite difficult (and expensive) to make your way back to town. You can also fly to Ouarzazate from Casablanca, then continue to Erfoud, Rissani and Merzouga. There are also weekly flights into Errachadia, about 2 hours north of Merzouga by car. Supra Tour buses from Marrakech and also from Fez have daily trips that stop in Merzouga village. If you're continuing on to one of the small villages nearby, such as Hassi Labied, the usual tourist price is a fairly steep 50 dirhams (total, not per person) for the short 5 km drive. Beware that overnight busses may sometimes arrive more than an hour early, putting you in Merzouga before sunrise. If this happens, you may find yourself with no cabs available, so be prepared to wait for someone to arrive. Tour operators can arrange 4x4s with driver/guides from Marrakech or Casablanca and back. The only way to get around Merzouga is on foot. It's fairly small and easily walkable, but you'll likely want to avoid the midday heat. Sunrise/sunset over the dunes. Folk dances and black G'naui music. Visits to villages near Merzouga inhabited by Senegalese musicians and dancers such as Khamlia can be arranged with some guides, ask at your hotel. Animals – see the ducks, and in early spring, flamingos, on the Dayet Srji salt lake, just west of Merzouga. There are many other species of birds (ruddy sheldrack and Kittllitz's plower during the spring migration, Tristram's desert warbler, the Egyptian nightjar, the arabian buzzard and falcons), and the desert sparrows are unique to this region and can be seen all year round. There are also reptiles (Algerian sand lizards, Berber skinks and snakes), mammals such as gerbils, desert hedgehogs, field mice and desert foxes, and scarab beetles. In the morning, you can often see their tracks in the sand. Brown scorpions can occasionally be seen, but they come out at night and tend to avoid humans. A few operators have their own private camps that will offer a more remote experience, ask around if this is what you seek. This provides a more intimate setting with fewer people and noise where you can relax and enjoy the stars. Cost a little bit more but worth it. Also check to see if showers are included after the camel trek. It is also possible to tour the dunes on ATVs, but this is highly discouraged.... You're destroying the beauty of what you came to see in the first place, and severely ruining the remote experience that most people are here enjoying on a camel. 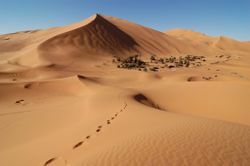 More tours are proposing in Merzouga desert, like [www.merzouga-tours.com] did, (☎ 00212 66 77 66 236), mail : [email protected]. An exceptionel experience with camels, 4x4, quad, ski, snowboard on the top on the dunes, etc. Sleeping in 3 stars hotels or in tent under millions of stars. A real nomad experience during 1 night or 1 month. For exemple, 1 night in the middle of the dunes in berbere tent, 4 hours going and come back with camels, with diner and breakfast, berbere music at night (drums), cost 30 euros. If you are planning a trip around January or February, you might join the Road Junky Retreat  when up to 20 travellers spend a week in the dunes with meditation, yoga and dance workshops as well as music and storytelling around the fire. Most people eat meals at their lodge, but a few basic restaurants are scattered around the town if you are in need. There are about 50 small hotels of varying categories along the sand dunes, and most of them own camels or can at least arrange your trip into the dunes. Merzouga is a beautiful romantic village in the middle of the desert. Women fall in love with the men here without realizing that the majority work as call-boys / prostitutes to survive. They are very loving and charming. They are professionals at making girls and women fall in love with them, talking about romance and the future. They love that life (even though they will say that they hate it), and have no intention to leave the desert or change their lifestyles. Many women/girls fall for this scam and end up being very hurt (and some lost a lot of money in the process!!). Supra Tour Buses now travel from the center of Merzouga village north to Meknes, Fes and also over to Ouarzazate and then Marrakech. This is new and an affordable way to get to the desert- but there are no stops to visit the Todra Gorge, Dades valley or Ait Ben Haddaou. Or to take rest stops at your leisure! This page was last edited on 19 March 2019, at 16:08.